At six o’clock this morning, I was rather annoyed to be awakened by a gang of squawking bluejays. But when I rose, I discovered a beautiful rainbow on the western horizon. Suddenly, I found myself feeling more than grateful for the wake-up call from the noisy, blue boys in my ‘hood. The rain has ended for now, and the morning sun is warm on the terrace, where I have set up my office for the day. But before I start work on plant lists for a garden design I’m working on, I have a neat garden project to share with you. Inclement weather kept me indoors early this week, providing me with a bit of free time and the opportunity to freeze fresh herb-cubes for winter. This project is simple and fun; easy as making fruit-pops and a great way to teach children about preserving food from the garden. If you also make a few juice pops at the same time —to reward the little helping hands— so much the better! 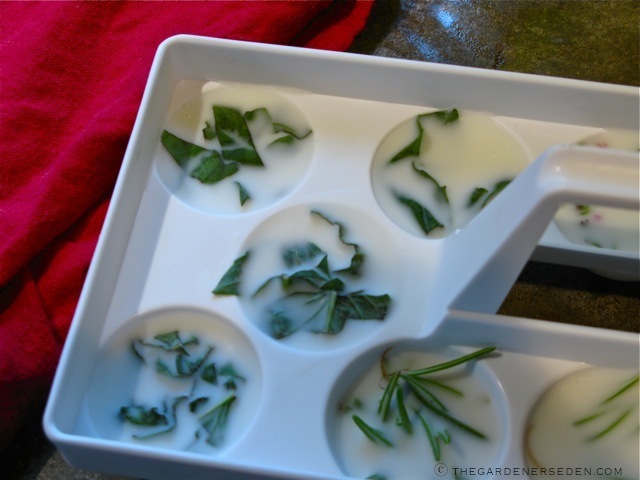 Begin by gathering empty ice cube trays (or egg cups or small freezer molds), zip-lock or other storage bags, and bundles of fresh herbs from the garden. Bring the herbs inside, and as you wash, dry and pick through the leaves, think about how you might like to use them over the coming months. Do you make lots of soup in winter? Set aside a few bundles of your favorite soup herbs. 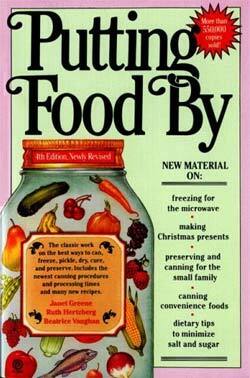 These can be frozen in cubes of room-temperature water, vegetable broth or chicken/beef bouillon. Do you like to fry or roast with herbs? Bundles of your favorite cooking herbs can be preserved by freezing them in vegetable oil (I like to use light olive oil for high-temp pan frying). If you like to use herb butters or herb-infused oils for bread dipping, you can freeze them in butter (softened or melted over very low heat and cooled a bit) or in extra virgin olive oil, to pull out of the freezer later and enjoy at room temperature all winter long. 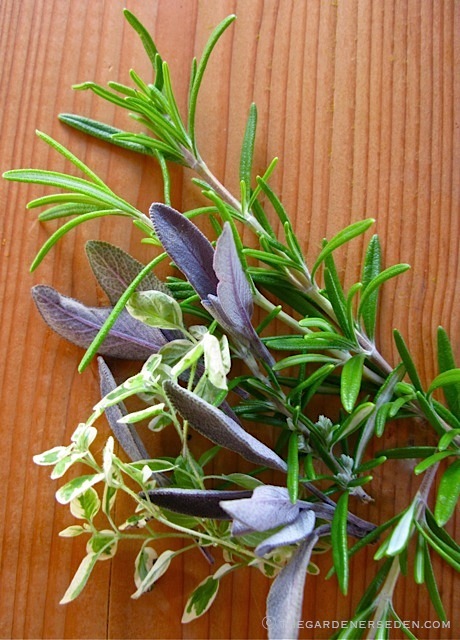 Tear or chop the herbs into small pieces or individual leaves, depending upon how you plan to use them at a later date. 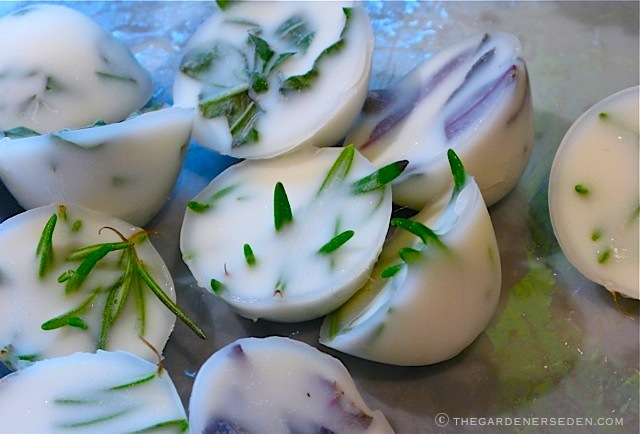 Next, load ice cube trays, egg cups or other freezer molds with the clipped herbs. 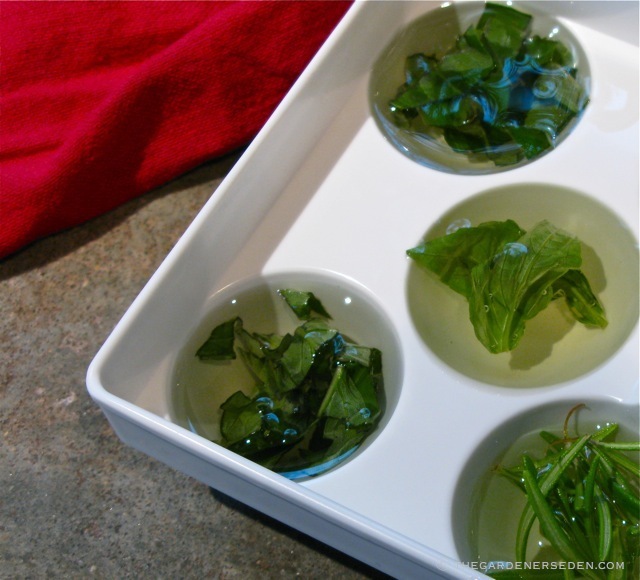 You can separate individual herbs into molds or you can mix them in combinations you frequently use together. I make both individual herb cubes and various combinations. I started with olive-oil cubes for pan-frying this time. 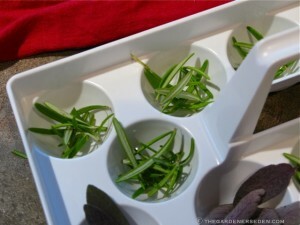 Once my compartments were filled with herbs, I began filling the cubes with oil, topping each herb mold with one or two tablespoons of light (frying) olive oil. Then I made herb cups with melted butter and extra virgin olive oil. Finally I put away large quantities of herbs preserved in vegetable broth (you can use any kind of broth) and water (for herb tea and soup). Once the molds are filled, freeze them overnight. You may wish to make a note of the herb content and oil/water measurement in each tray. Once frozen, it can be tricky to identify the herbs. I do freeze in batches and make notes to avoid confusion later. Once removed from the freezer, pop the cubes from the trays and slip them into labeled plastic bags. I write the name(s) of the herbs, the fluid measurement, and the date on my bags. Then, I store them flat in the freezer (they should remain in separate units, unless they melt – so work quickly!). Now, you can enjoy fresh herbs in your cooking all winter long, at a fraction of the market cost! After Freezing for 24 Hours – Remove the Cubes from the Trays and Separate into Labeled Ziplock Bags. Store Flat in the Freezer. 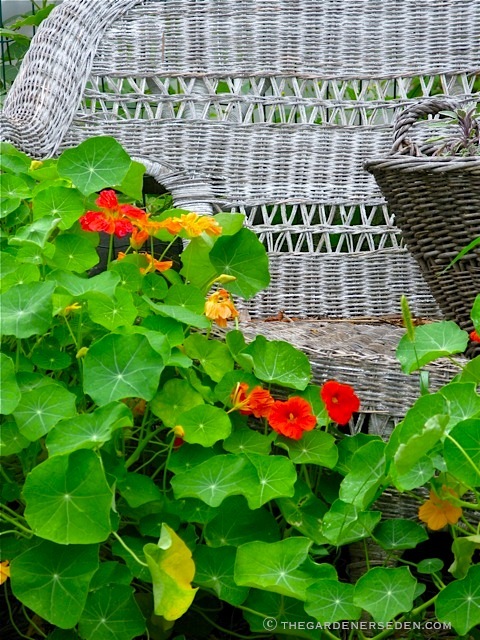 There are many ways to preserve and store your garden produce. This particular method of freezing herbs has been around for a long time —my mother and grandmother used to preserve them in this way— and it works very well. 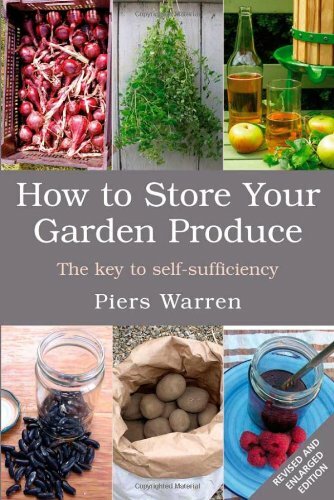 If you are interested in learning more about how to preserve your garden produce, I highly recommend the two books pictured and linked below, which I reviewed for Barnes & Noble’s Garden Variety Blog in June (click here to read the post on B&N, where you can also purchase either book). Both titles contain new & old ideas —freezing, drying, root-cellaring and more— for preserving the harvest. 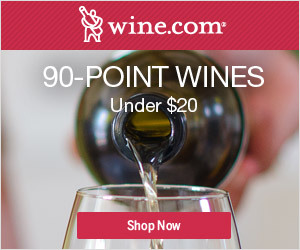 DIRECT LINKING OR PINNING THIS PAGE TO PINTEREST IS WELCOME! HOWEVER, PLEASE DO NOT REPOST, RE-BLOG OR OTHERWISE USE PHOTOGRAPHS OR TEXT FROM THIS WEBSITE WITHOUT WRITTEN PERMISSION. CONTACT INFORMATION IS AT LEFT. THANK YOU! MICHAELA. All photographs, articles and content on this site, (with noted exceptions), are the original, copyrighted property of Michaela Medina – The Gardener’s Eden and may not be reposted, reproduced or used in any way without prior written consent. Contact information is in the left side bar. Thank you! You are currently browsing entries tagged with Freezing Herbs in Oil/Water/Broth/Butter at The Gardener's Eden.